Perfect spring weather greeted recruitment efforts at Bilkent University's Spring Week Festival in early May helping volunteers to sign up more than 150 students interested in learning about and ultimately playing cricket. Under the theme of celebrating the ICC's centenary celebrations, the stall next to the main stage of the festival was decorated with posters depicting local teams and previous matches as well as famous scenes from international cricket. As an inducement to sign up volunteers handed out footballs, t-shirts, volleyballs and two lucky persons won an MP3 player. A bit of "backyard cricket" was also played around the stall to give visitors a feel for the game that is virtually unknown in Turkey. The new members of the Turkish Cricket Fan Club under the leadership of masters student Şener Sen will now be targeted with direct e-mails, invited to cricket club parties and videos on Campus, will be able to take part in cricket computer game competitions and are now members of a Turkish Cricket Fan Club online forum to be set up shortly. 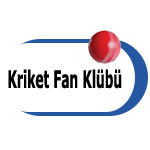 Most importantly though the new members will take part in a basic cricket course in October 2009 aimed at introducing the game and building a future for Turkish cricket. Turkey is preparing to take part in its first ever international match when the national team travels to Corfu, Greece in September to take partin the ICC - European Division V Championship. It will be a tough assignment for those honored to play for Turkey with five 50-over matches to be played over six days. To get our players up to scratch a cricket coach from England will be coming to Ankara in July to help train the players before they take on the best of Bulgaria, Czech Republic, Estonia, Greece and Sweden. Turkey's first-ever junior cricket program got under way in April 2009 at Ankara's Bilkent University Preparatory School (BUPS), with boys and girls in the 3rd, 4th and 5th grades getting the chance to lay bat on ball. Under the supervision of BUPS Physical Education teacher David Ogilvie (an Australian with a Level 1 coaching certificate) the boys and girls are learning the basics of batting, bowling and fielding. The eight-week course, which is supported by the Turkish Cricket Board and ICC-Europe, will end with a "Super Eight" competition where the parents of the students are invited to watch. physical education teachers at the school and plans are afoot to expand the program to other private school's in the Turkish capital. "Our hope is that these courses will not only be fun for the children involved but will also strengthen Turkish cricket in the years to come," said Syed Mahmud, chief executive of the Turkish Cricket Board. Turkey's Summer 2009 domestic season gets underway on May 2 with the Ankara Tigers taking on the Red Lions at Ankara's Bilkent University Football Field. This year the seven teams are to be split into two leagues, playing different formats of the game. 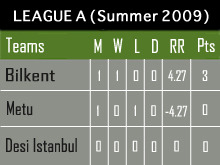 League A, consisting the teams of Bilkent, METU and Desi of Istanbul, will be playing 30/30 whilst League B will be playing 20/20. 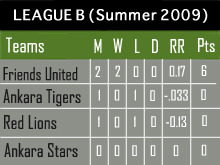 The winner of each league will then play each other for the Republic Cup in October 2009.